We all know that intarsia can’t be done in the round. (Well, you can do some tricks that involve working back and forth, or seaming up the side, but it’s not really possible to do it properly.) 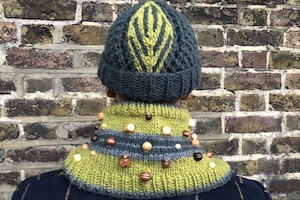 You CAN, however, work a panel of stranded (think Fair Isle) knitting in the round, where the colorwork does not go all the way round the piece, but is only worked in one specific area, like a patch. This is a technique that I have engineered myself, and it’s really fun to do. Its applications are many and various. You can, for example, put a contrasting motif on the ankle of a sock, or a sports logo on the front of a hat. Fancy working a patch of colorwork into the breast of a sweater knitted in the round? Thought you could only achieve it with duplicate stitch after the event? Not any more! Now you can add little patches of stranded colorwork anywhere you like in your in-the-round projects. Skills covered: Knitting back backwards (the ability to work your knitting from the right needle to the left, so that you don’t need to turn the work), how to create the Strantarsia panel itself, and the mechanics of how it works, tips on joining the colors so that there are no holes where one section flows into the next.